The vision for a March on Washington in 1963 was born in 1939 when Marian Anderson was invited to sing in front of the Lincoln Memorial. Anderson’s concert attracted the first major integrated gathering of 75,000 citizens to the nation’s capital, exciting the imagination of an eleven-year-old Martin Luther King, Jr., and those of A. Philip Randolph and other African American leaders. Anderson’s recital was a success. Randolph, learning from this experience, decided that Washington, DC, could serve as the site of a march designed to pressure the US government to guarantee civil rights. The threat of a march in 1941 forced President Roosevelt to sign an executive order better guaranteeing employment rights for African Americans. The need to fulfill the threat of a march was clear when toxic expressions of racism were dramatized in the summer of 1963 with lynchings, bombings, and a presidential administration in power that was equivocating on civil rights legislation. 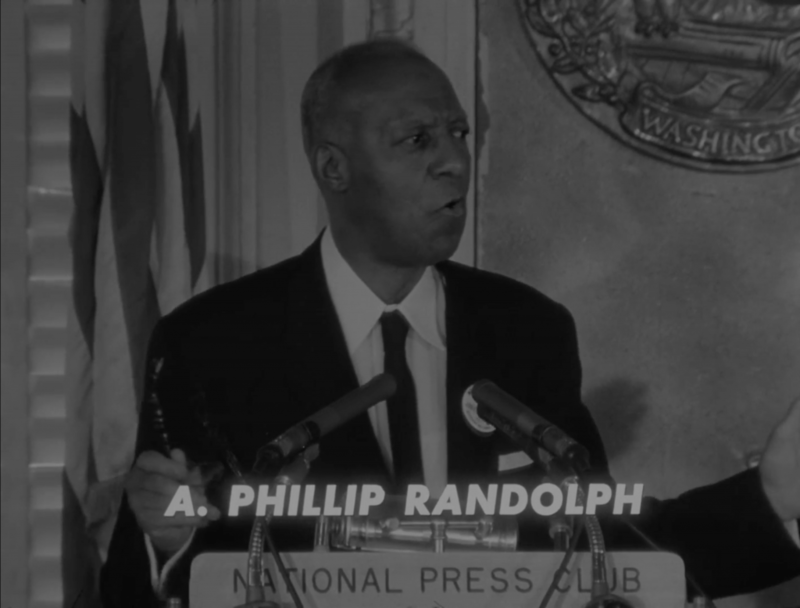 A. Philip Randolph (his name is misspelled in the overlaid text) was a leader of the March on Washington Movement. Still from The March by James Blue (1964). A. Philip Randolph, in collaboration with Bayard Rustin, organized the 1963 March on Washington for Jobs and Freedom. 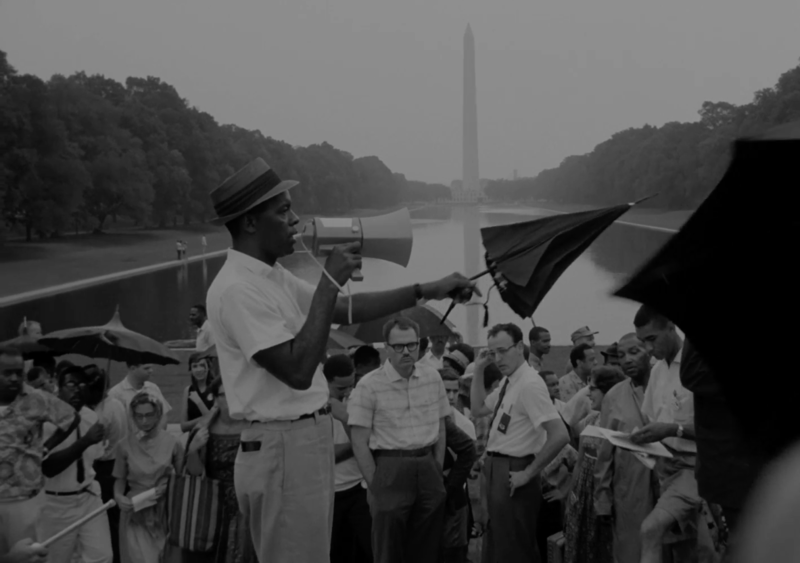 The idea for the 1963 March was born in 1939 when Randolph and other civil rights activists decided that a “March on Washington” movement would pressure the US government to better its treatment of black citizens. The threat of a march was sufficient to force the Roosevelt administration to issue Executive Order 8802, which banned discriminatory employment practices by federal agencies. To push the Kennedy administration, Randolph, Martin Luther King, Jr., Bayard Rustin, and others decided not only to threaten but to carry out a March on Washington in August of 1963 to pressure the government to pass civil rights legislation. Preparation for the March required herculean organizational powers, provoking struggles with the Kennedy administration, sparking conflicts within the March’s leadership, and prompting a dark foreboding that the March would fail. Despite these struggles, 200,000 citizens participated in a disciplined and effective nonviolent protest. Historians tell us that the March helped to provide the political and rhetorical ground needed to pass the Civil Rights Act of 1964 and the Voting Rights Act of 1965. Some credit Blue’s film with making King an international figure. James Blue finished The March in late November, 1963. The film was then distributed to diplomatic posts around the world and viewed by President Johnson, Attorney General Robert Kennedy, US Senators, and the USIA Advisory Committee in January 1964. Carl Rowan, Director of the USIA, created an introduction for the film in April 1964 to address the concerns expressed by the President and other critics of the film.